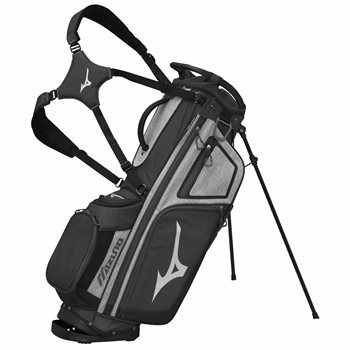 The Mizuno BR-D4 stand bag features a 9.5” 4-way top with full-length dividers to organize and protect your clubs. Other features of the bag include refined heathered panels, a zip-off embroidery panel, a cart strap channel, double shoulder straps, a bottom grab handle, an insulated drink pouch, an umbrella holder and a matching rain hood. The BR-D4 stand bag is equipped with ample storage space that includes an apparel pocket, a valuables pocket, a cooler pocket and a magnetic pocket.